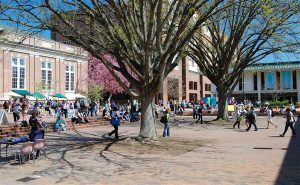 Anyone who has walked around the campus of the University of North Carolina at Chapel Hill, whether strolling past famous examples of neoclassical architecture or hurrying to class past institutional buildings, has at least heard of The Pit. The unofficial center of UNC and beloved fixture of campus life, where The Pit now sits was once home to the primary athletic field on campus. Emerson field, completed in 1916, was the original home to football, baseball and track events on campus. Carolina’s football program quickly outgrew the field and moved to Kenan Stadium upon its completion in 1927, but track events and baseball games continued to be held at Emerson Field until 1935 and 1965, respectively. 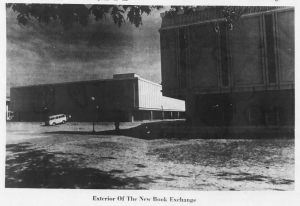 In 1967, Emerson Field was cleared and construction began on UNC’s student union, bookstore and undergraduate library. As construction on new campus additions carried on, a problem developed: a large mud pit. Construction had made a wide and shallow hole in front of the bookstore, and the combination of moved earth, foot traffic and rain resulted in what was called a “man-made mud crater” by the Daily Tar Heel. Sometimes, though, truth is endearing and punchy as-is. 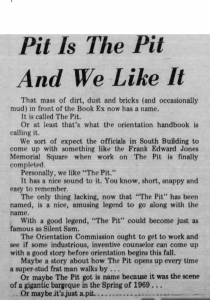 “The Pit” is just as good a name as any other, and better than most.